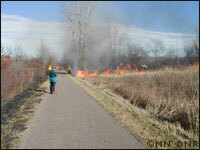 Prescribed burn along the Gateway State Trail. 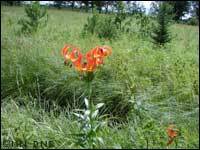 Natural mesic prairie opening in Paul Bunyan State Trail right of way near Pine River. The Natural Communities Restoration and Management Program's purpose is to improve the quality of natural plant communities, wildlife habitat, and regional landscape integrity, enhancing the recreation experience and raising awareness of our natural heritage. Identify, preserve and manage natural plant communities. Minimize construction damage and revegetate disturbed areas with native plants that are ecologically appropriate for the area. Work with trail user groups and local citizen groups to foster understanding of and participation in management. Interpret natural plant communities and management practices to the recreating public. Provide technical information and assistance to staff and to the public. Integrate natural resource management priorities into regional budgets. For more information, contact the Resource Management Consultant, Parks and Trails Division, 651-259-5594.